We can’t actually say when the first hunting knife was used and by whom, but it is clear that it must have been around for thousands of years. As in ancient times, people need to hunt in order to eat. So, it will not be wrong to say that hunting knives are being used since the Stone Age as relics from that era are still being found to this day, proving that these blades were being used by the earliest of men. Stones, shells and bones were fashioned into good hunting knives to be used while hunting and after, to skin their prey and prepare it for eating or storing purposes. It might be the Ancient Egyptians that contributed to the use of handles in such blades though they used both big hunting knives and smaller ones for skinning and cutting up meat. It wasn’t until James Bowie (Jim) completely changed the concept and outlook of these blades. After receiving the best hunting knife from his brother, Jim made changes to it over the years. Famous for surviving the sandbar fight, the American folk hero modified various blades according to his needs, taking inspiration from other knives from his time. The bowie hunting knife that we are accustomed to nowadays was quite different in those days as any large sheathed blade, which had a clip point and crossguard, was considered a bowie knife. Anyhow, after the sandbar fight, the blade gained popularity among hunters due to its efficiency for skinning and slicing up a game after the hunt. Now, all that made its way to the current fixed blade hunting knives as many of these blades take after the bowie’s designs. Why you Need a Hunting Knife? Fishermen can wonder why shouldn’t we take our filleting knives instead of going to the trouble of wandering around in search of cheap hunting knives for sale available in the market. Even though it’s a valid reason, it’s not sufficient enough to hold for long. Why? Because the filleting blades can’t perform all the other things a hunting knife can help you out with. Using high quality hunting knives, you can open up cans to take food out, cut wood to make kindling for fire, you can even protect yourself against wild raging boars and so much more. But, it’s better not to use your high end hunting blades in this manner and that is exactly why many people take along folding pocket knives with them on such expeditions. Using a pocket knife for doing other chores, like cutting wood and opening up cans, can help keep your hunting knives in top condition. It’s only proper that we talk about what types of materials are used to make the various hunting and survival knives being sold in stores. 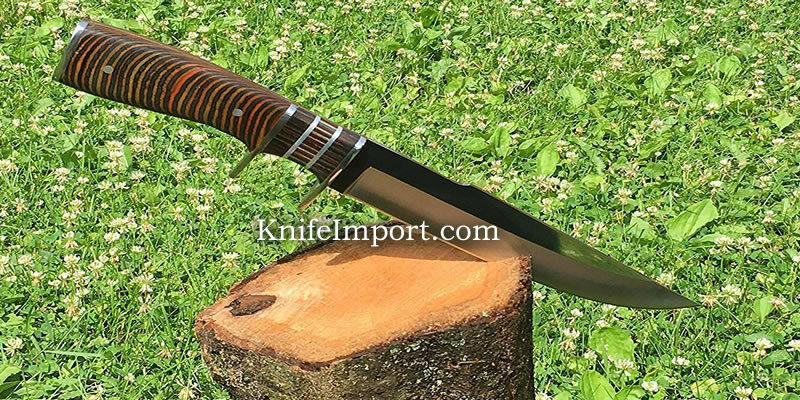 Knife Import also have varying hunting blades, made from different materials, so you can take your pick now and buy the best hunting knives that you can find online at wholesale prices. What is the difference between them you ask? A carbon steel hunting knife is prone to rusting that is why it needs regular maintenance and sharpening. Hunters going to catch a prey in rainy or humid part of the area, prefer not to take carbon steel blades and rather go for stainless steel or carbon stainless steel knives. As these two blades have no chances of catching rust unlike the carbon steel ones that need to be used often and kept clean for maintaining its usability. When you have finally decided to go on a hunting trip, then what’s wrong with taking along a set of cool hunting knives? As each blade in this hunting knife set is designed for a specific task, it really makes the job easier for you. Depending on the circumstances, you will not have to kill, skin and cut up game using the same hunting knife but you can use the ones specifically made for that purpose. Automatically, making it easy for you to enjoy the hunt rather than slaving away with a single blade at everything. You can choose whichever blade you prefer, but you must know that clip point style is influenced from the recently discussed bowie knife and its named clip point because the blade seems to be clipped around the tip. This gives it an advantage at stabbing something yet, while skinning, the risk of puncturing a game’s organ also increases. On the other hand, the drop point is less popular than clip point but still used heavily as it allows its wielder more control and durability, while decreasing the risk of cutting into the softer parts of a game. Lastly, a trailing point is the best hunting knife that has a spine curving upwards and then backwards towards the point. This allows the hunter to easily and quickly skin his/her prey, thus its named the skinner as well. All in all, good hunting knives have a fine handguard, ergonomic handle, and fixed blade that can be safely secured in a quality sheath. Folding hunting knives are also available out there but that feature only decreases the blade’s worth. Thus, it’s better to go for the best fixed blade hunting knife, when out shopping for your hunting gear. Because If anything is to happen during the hunt that makes your blade to fold, it can end up having very bad consequences for you or anyone else around you. We hope we have cleared up your misunderstandings and given enough information on this page that you will be able to get yourself the best hunting knife in the world, if you have to now. Until next time, take care of yourself and your cool knives!